Create an organized home office with the Ameriwood Home Dakota Space Saving L Desk with Hutch. This Desk features a classic L shape to give you plenty of room for your laptop, with additional room to spread out projects or paperwork. The Hutch gives you even more room to store notebooks, documents, binders or photos with its 5 open cubbies. This Desk is designed to give you plenty of leg room but also doesn’t take up too much space in your home. The medium brown walnut finish works well with most décor. 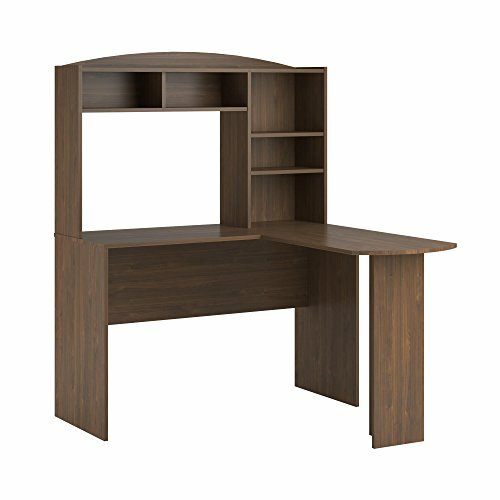 Ameriwood Home Dakota Space Saving L Desk with Hutch requires assembly upon delivery. View More In Computer Armoires & Hutches. If you have any questions about this product by Ameriwood Home, contact us by completing and submitting the form below. If you are looking for a specif part number, please include it with your message.